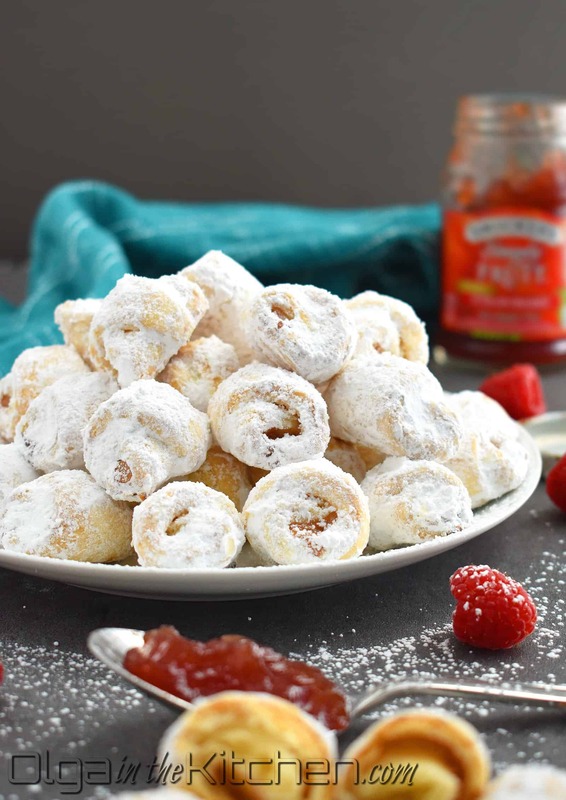 Strawberry Rugelach (rogaliki): simple, soft and flaky little treats, drenched in powdered sugar for sweetness. These cookies are simply stunning and festive for big events, holidays or simply any day of the week. 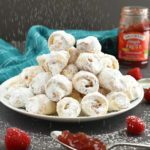 The way these cookies are prepared are not your usual crescent rolls rolling. Instead, you cut out the rolled out dough diagonally, like you would for baklava. Sealing the corners with egg wash to prevent from unrolling and making sure the fold is underneath the cookie rather than on top or on a side. 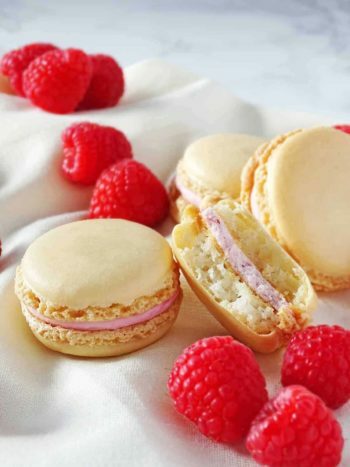 You can use any kind of preserves for the filling. I always did a touch of black currant of strawberry. Why a touch? Because I make these bite size (about 1 1/2″ – a bite size). You cannot really put too much preserves, otherwise it will leak out during baking process. 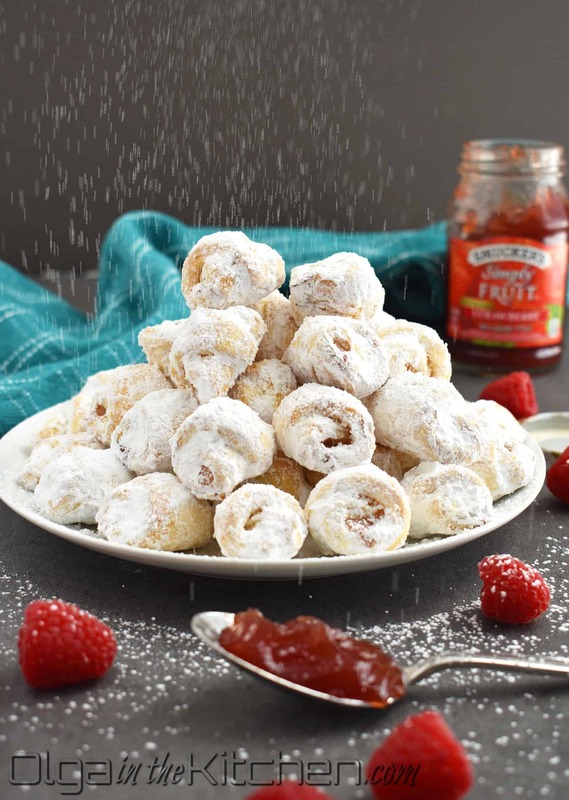 The little amount of preserves and powdered sugar is plenty of sweetness as the actual dough does not have any sugar in it. I recommend using preserves instead of jam; jam tends to really leak out because it’s too juicy. 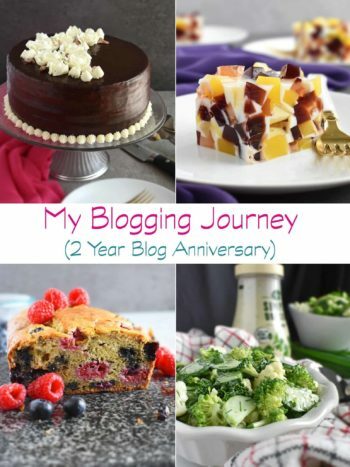 I never tried with poppy seeds because in my little family no one likes poppy seeds. Shocker, right? A Ukrainian who doesn’t like poppy seeds? 😀 If you love desserts with poppy seeds, go for it and you’ll be able to pack more filling. I use Bob’s Red Mill flour in this recipe and you can also use the organic all-purpose from Costco or any similar in texture. The amount of flour will depend on the type of flour you use and its moisture. It might need slightly more. The dough will be soft, but not too sticky. Do not add excess amount of flour as it will make these cookies hard. 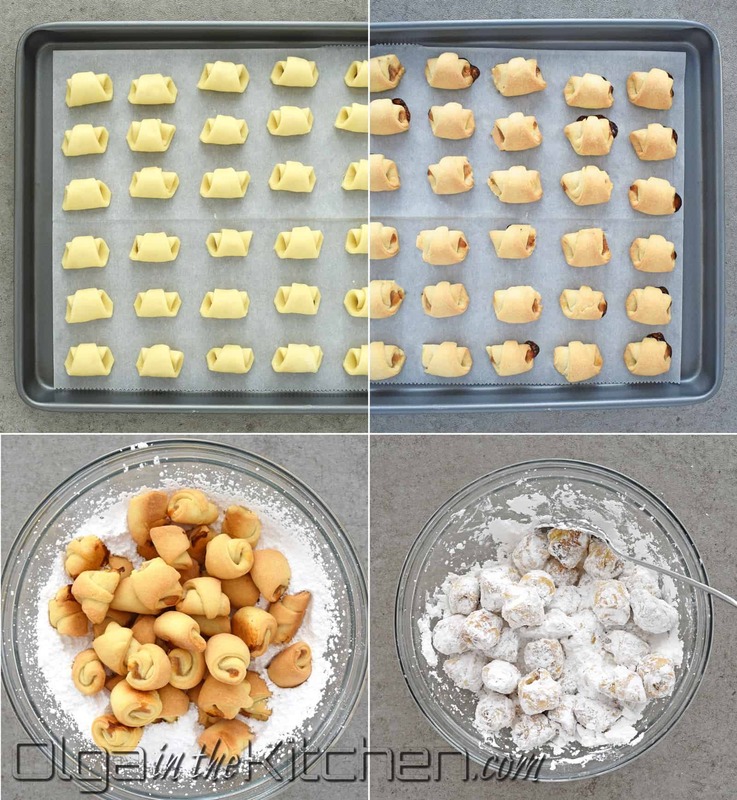 Keep adding little flour every time you roll out the dough to prevent dough from sticking. Because of the yeast, these cookies will slightly rise while you fill one baking sheet. As soon as I fill a baking sheet, I send it to the oven so that they don’t grow too much at room temperature. It will cause them to unroll as the little amount of egg wash will dry out. Refrigerate the remaining dough while you work with first portion. It will make the dough roll out easier and you won’t have that urge to add more flour! Preheat the oven to a 350°F. Line a parchment paper with 2-3 baking sheets. Set aside. In a small bowl, combine and whisk 1 egg and 1 tbsp water – this will be your sealer to keep the cookie ends from unrolling. Set aside. 1. In a large bowl, combine 1 cup sour cream and 1 tbsp instant yeast. Let it stand for 5 mins. Then add 2 sticks unsalted butter (sliced), 1/4 tsp salt and 3 cups flour (1 cup at a time; might need more). 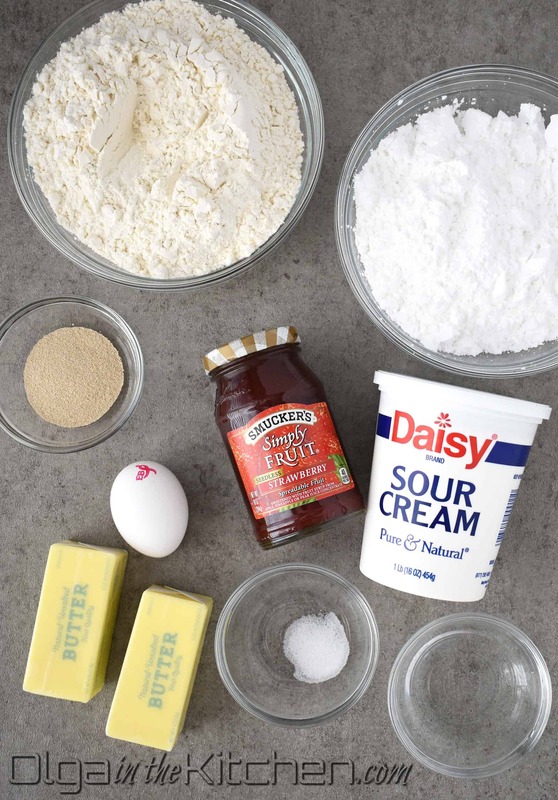 Using your hands, rub the butter with flour and mix all ingredients to turn into dough. Turn the dough onto lightly floured surface. 2. Knead the dough until smooth, but not sticky. On a lightly floured surface, roll a portion of the dough out to about 2mm thick. Using pizza cutter, slice dough like you would slice baklava. Very diagonally, about 1 1/2” wide and 2” in length. (I use Wilton icing spatula to help me cut these equally). Remove dough scraps and save for next rolling. (Refrigerate the dough while you fill these). Place little amount of preserves in center of each cookie dough. Fold and gently press one side over the preserves. Tap egg wash at the other corner of the dough and roll that corner over the folded part. Gently press to seal underneath the cookie. (make sure the ends are underneath the cookie to prevent from opening during baking). 3. Transfer cookies onto prepared baking sheet, 1” apart. Bake for 18-20 mins until lightly golden. 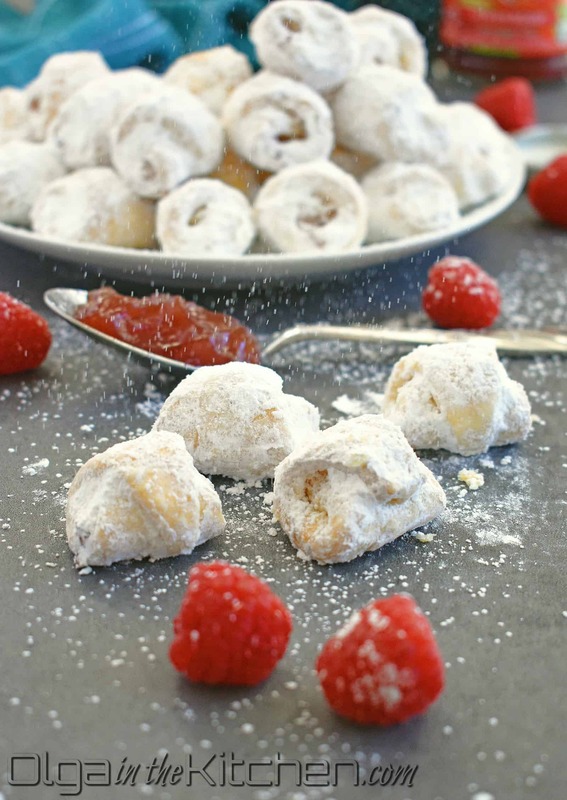 Once baked, let the cookies rest for 5 minutes, then transfer them into big bowl with powdered sugar, removing any excess amount of preserves, if any (preserves will peel off easy). 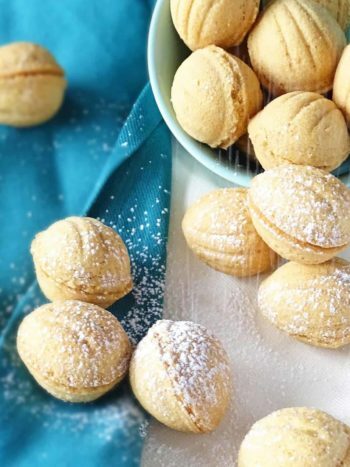 With a large spoon, gently stir cookies to coat with powdered sugar and transfer to a clean bowl or platter. Repeat steps for remaining dough until no dough is left. These stay delicious for up to a week, but they will be gone in hours! In a large bowl, combine 1 cup sour cream and 1 tbsp instant yeast. Let it stand for 5 mins. Then add 2 sticks unsalted butter (sliced), 1/4 tsp salt and 3 cups flour (1 cup at a time; might need more). 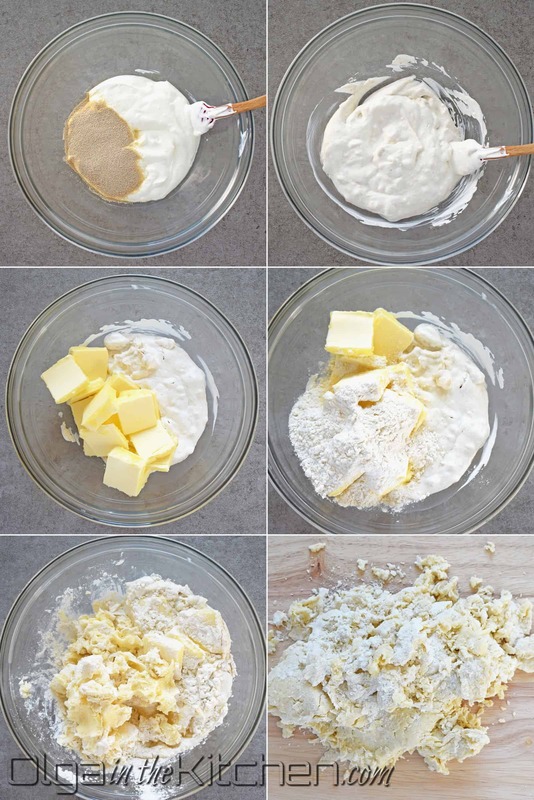 Using your hands, rub the butter with flour and mix all ingredients to turn into dough. Turn the dough onto lightly floured surface. Knead the dough until smooth, but not sticky. On a lightly floured surface, roll a portion of the dough out to about 2mm thick. Using pizza cutter, slice dough like you would slice baklava. Very diagonally, about 1 1/2” wide and 2” in length. (I use Wilton icing spatula to help me cut these equally). 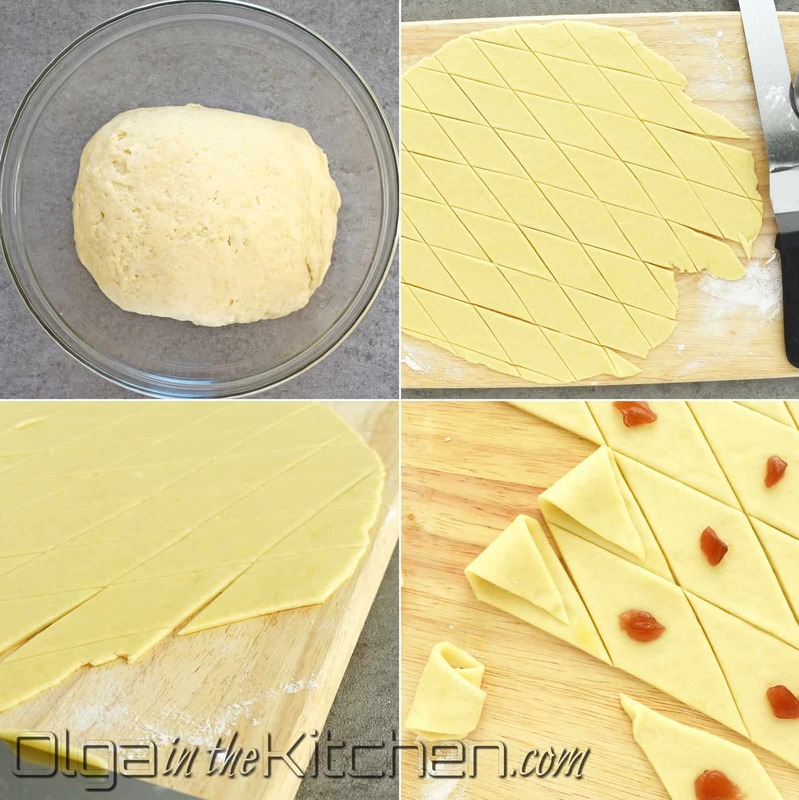 Remove dough scraps and save for next rolling. (Refrigerate the dough while you fill these). Place little amount of preserves in center of each cookie dough. Fold and gently press one side over the preserves. Tap egg wash at the other corner of the dough and roll that corner over the folded part. Gently press to seal underneath the cookie. (make sure the ends are underneath the cookie to prevent from opening during baking). Transfer cookies onto prepared baking sheet, 1” apart. Bake for 18-20 mins until lightly golden. 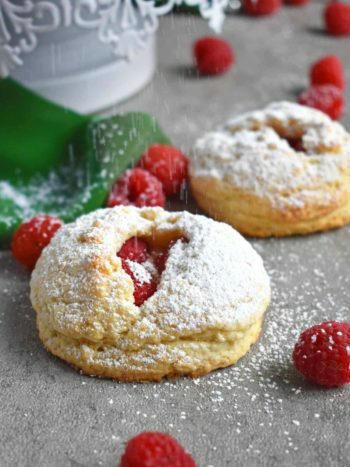 Once baked, let the cookies rest for 5 minutes, then transfer them into big bowl with powdered sugar, removing any excess amount of preserves, if any (preserves will peel off easy). 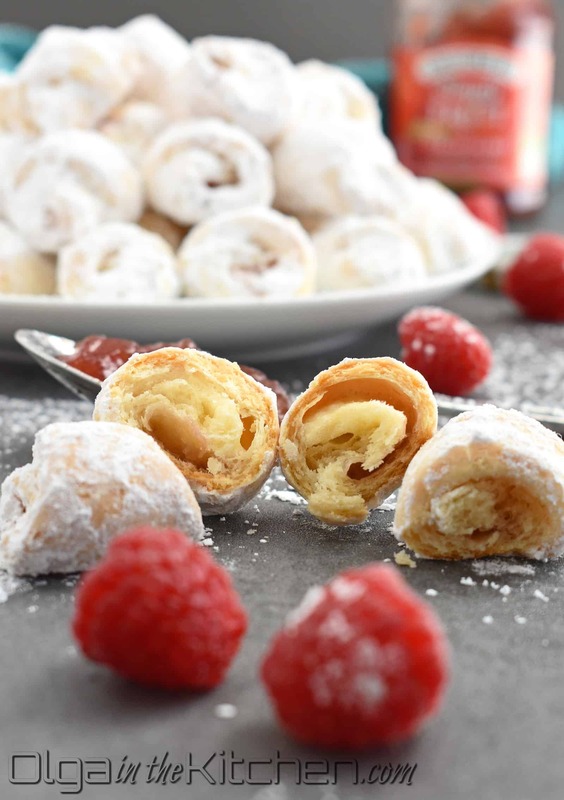 With a large spoon, gently stir cookies to coat with powdered sugar and transfer to a clean bowl or platter. Repeat steps for remaining dough until no dough is left. 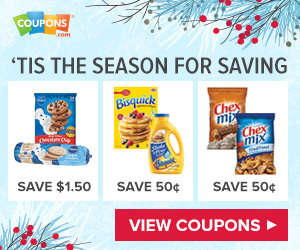 These stay delicious for up to a week, but they will be gone in hours!